PRODUCT DESCRIPTION: This unit is powered by 4 Double "A" batteries. Quality batteries will provide 40-50 kills per set of 4. These traps produce death via electrocution which is delivered through a high voltage shock. 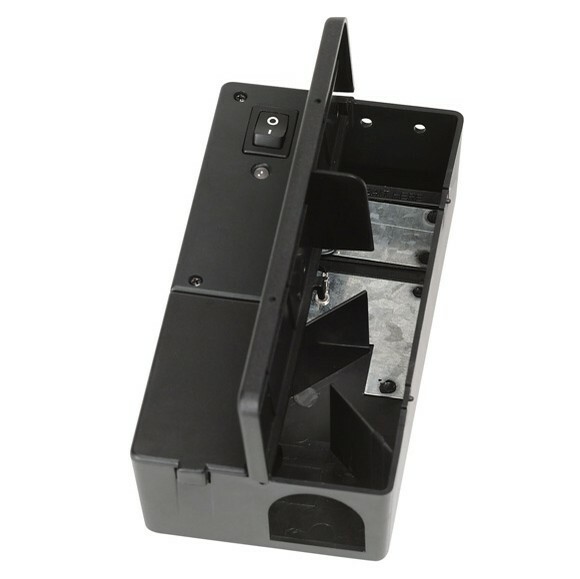 Electronic traps are easy to use, economical, and provide a quick, humane kill, simply bait and turn ON. Once the rodent is inside, the system delivers a humane, high-voltage shock to effectively kill the rodent. A green light blinks to indicate capture and a red light blinks to indicate low batteries. Rodents can then be dumped directly into the trash for no-touch, no-view rodent control. WHERE TO USE IT: This unit is a smaller unit and is intended to be used on mice and shrews.